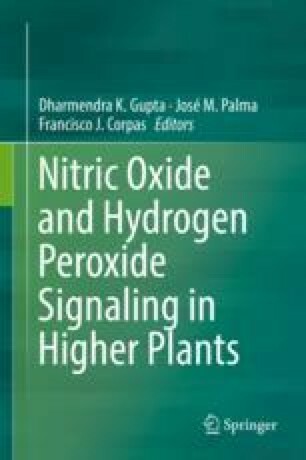 Nitric oxide (NO) and hydrogen peroxide (H2O2) have profound effects in growth and development processes in plant physiology. They act as signal molecules under normal conditions or biotic and abiotic stress situations. Fruit ripening is a highly coordinated process that needs the control of several biosynthetic pathways, including signal molecules such as NO and H2O2. On the other hand, enzymatic and nonenzymatic antioxidants act to maintain the equilibrium and to prevent oxidative stress. This forward look reviews the relationship between these two active species and their interplay with ethylene in climacteric and non-climacteric fruit ripening. Throughout we emphasize the influence of NO and H2O2 crosstalk coupled to the hormone control, chloroplast to chromoplast transition, and their implications in postharvest technology. Our work is supported by the National Scientific and Technical Research Council (CONICET) (Argentina) and the National Agency of Science al Technology Promotion (ANPCyT PICT 2015-0103) (Argentina). CS is a fellowship student of the ANPCyT, and AG, CGB, and GEGG are carrier researchers of CONICET. The authors also would like to thank the editors for considering our chapter as part of this book.